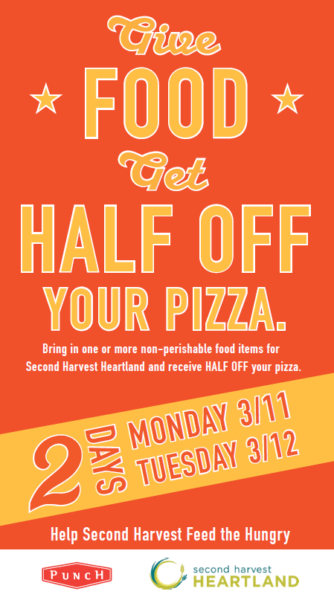 Today and tomorrow (3/11 and 3/12), donate a non-perishable item to Second Harvest Heartland at Punch Pizza and you’ll receive 50% off your pizza or large salad! There is a limit of one discount per person, not applicable for online orders. See a list of Second Harvest Heartland’s most needed items here. We love Punch Pizza all the time, but just a little bit more when they have one of their awesome offers. They have a GREAT one for Valentine’s Day! To celebrate this day of love, visit Punch Pizza to buy one pizza and get one FREE from 4 pm – close! Print out the coupon HERE or show it on your phone. Free pizza must be of equal or lesser value. Limit one per customer. 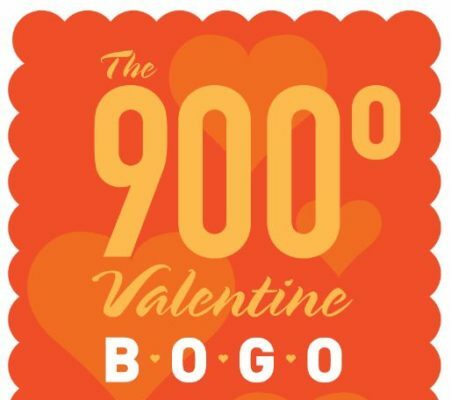 Not valid for takeout at the Highland Park location or with any other offer. Check another item off your list and get a FREE pizza, as well! 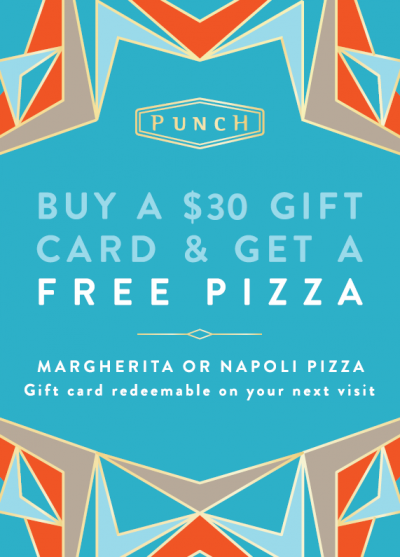 Now through the end of the year, buy a $30 Punch Pizza gift card and get a FREE Margherita or Napoli pizza. You can redeem the free pizza at the time of purchase or get a coupon to use later. Can’t make it to the restaurant? You can also order gift cards online. Note that the gift card is only redeemable on your next visit. 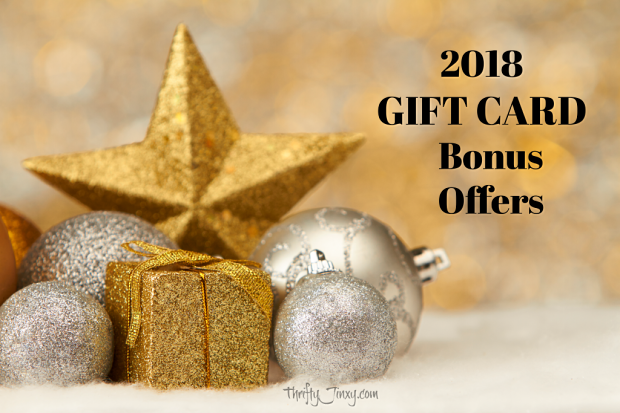 Find more restaurant gift card bonus offers here! 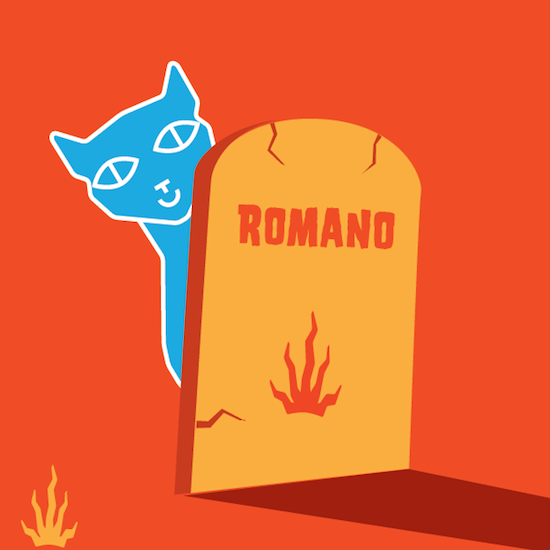 Punch $3 Dead Pizzas – Wednesday Night! This awesome annual event is back again at Punch Pizza on Wednesday, October 24th, 2018, after 5pm ONLY! 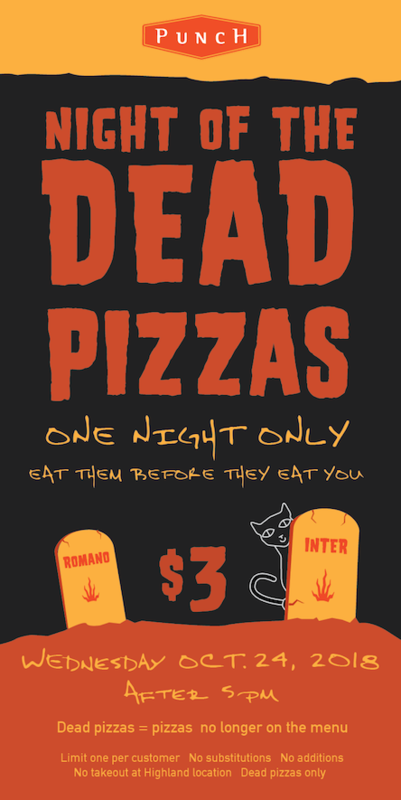 You can get your favorite Dead Pizza for only $3. Don’t know what a “dead pizza” is? Dead pizzas are the pizzas that once were on the Punch menu but no longer are. You can see the Punch Pizza Dead Pizza menu here (click on the little pizza mummy at the top) to check out all your options. I’m a big fan of the Tripoli with prosciutto, onion and rosemary. Yum! This offer is limited to one per customer with no substitutions or additions. No takeout at the Highland location. Dead pizzas only. Punch Pizza: $3 Dead Pizzas TODAY ONLY! For updated info for 2017 click HERE! This favorite annual event at Punch Pizza is back again!! 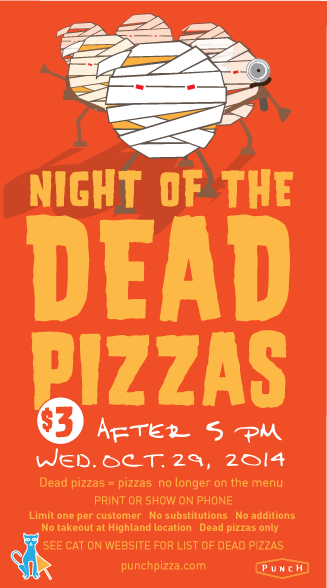 TODAY ONLY, October 28th, after 5pm, you can get your favorite Dead Pizza for only $3. If you don’t know what a “dead pizza” is, it’s the pizzas that once were on the Punch menu but no longer are. You can see the Punch Pizza Dead Pizza menu here to check out all your options. To get your dead pizza for $3, either print out this coupon or show it on your phone. Which pizza will YOU get?? Punch Pizza 50% Off Tonight!! I love when Punch Pizza runs these discounts! Tonight (Wednesday, February 11) after 5pm you can get 50% off any one pizza at Punch. To get the discount just print this coupon or show it on your phone. 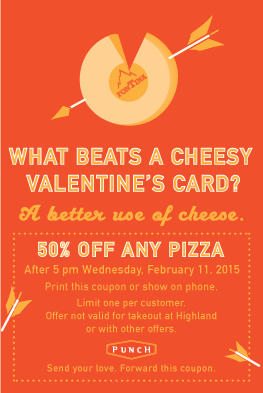 Offer not valid for takeout at Highland or with other offers. 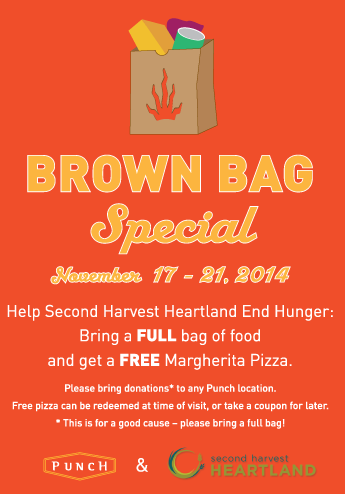 Today through November 21, 2014, donate a FULL bag of food to Second Harvest Heartland at Punch Pizza and receive a FREE Margherita Pizza! Your free pizza can be redeemed at time of visit, or take a coupon for later. Since it is for a very good cause, please make sure you bring a FULL bag of food! This is my favorite day at Punch Pizza every year! 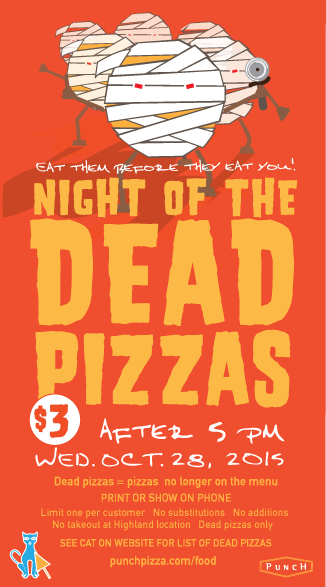 $3 Dead Pizzas at Punch Pizza is an annual Halloween tradition and today is the day they return! (10/29). Dead Pizzas are pizzas that are no longer on the menu and you can get one for only $3 after 5pm!! Limit one per customer. Find a list of Punch Dead Pizzas HERE. You can either print the Punch Dead Pizza coupon or show it on your phone. 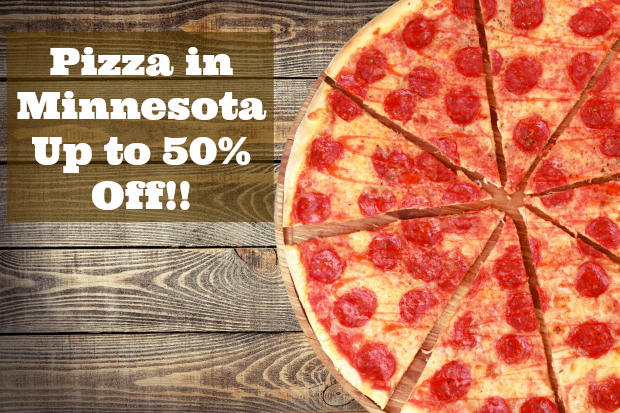 Keep reading Thrifty Minnesota for lots more local deals or “like” our Facebook page! Ya just gotta love the great offers from Punch Pizza!! This one is a doozie! 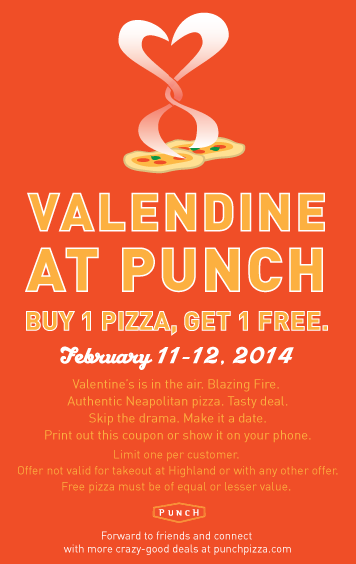 To celebrate Valentine’s Day, visit Punch Pizza 2/11 or 2/12 and buy one pizza and get one FREE! Limit one offer per customer. Print out the coupon HERE or show it on your phone. Not valid for takeout at Highland or with any other offer. Free pizza must be of equal or lesser value. FREE Mimi at Punch Pizza Tonight!! Awesome!! It’s another freebie at Punch Pizza. 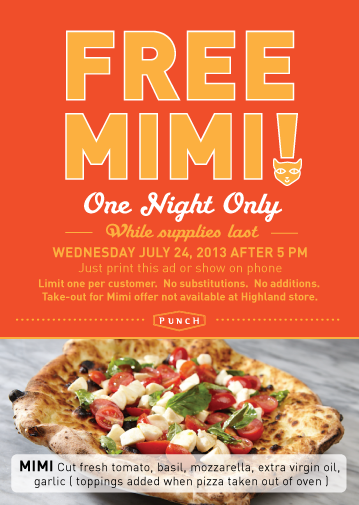 Tonight only, 7/24, after 5pm you can get a FREE Mimi at Punch Pizza. I looooooove the Mimi! It is cut fresh tomato, fresh mozzarella, basil, extra virgin olive oil and garlic all added on to the top of your pizza crust AFTER it is taken out of the oven. It is so delicious and fresh tasting. To get the freebie, you must print the coupon or else show it on your phone.